... captured in different lights looks stunning in every season and will greet you daily from its prominent position. 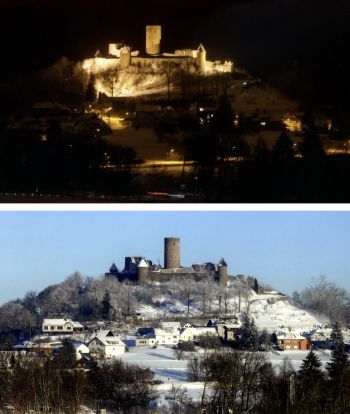 First mentioned in the records in 1166, the castle is seated on the Mons Nore (the black mountain), a former volcano with an altitude of 678 m. It is the highest located castle in Rhineland-Palatinate and with the peculiar shape of its roofs is also one of the most beautiful in the region. The castle can be reached by a short footpath. You can climb the donjon (tower) via a set of stair in the inside. Having reached the top, the wonderful panorama of the Eifel region and the "green hell" of the Nürburgring unfolds before you. Some say that you can even spot the Cologne cathedral on clear days. Also don't miss the hiking loops at the foot of the castle leading around the volcanic cone. Sparse pastures, thin cattle, herded by haggard shepherds. This is how an unknown poet and philosopher described the Eifel region in former times. Surely you'd be thrilled to find out how this once disadvantaged German region has changed. You'll be surprised and delighted to explore our beautiful region. ... with its "Nordschleife" (North Loop) is one of the world's most beautiful, well-know and difficult racing courses. The 24h race, the DTM, the truck racing ("Truck Grand Prix") and the vintage racing ("Oldtimer Grand Prix") are an integral part of the motorsport season here. Among the great attractions of the Nürburgring are also the "Touristenfahrten" where the public can use part of the track driving their own vehicles. Driving at race pace in the passenger seat of a race taxi is a truly exciting experience, too. ... offers various leisure and vacation activities besides the motor sport. Immerse yourself in the beautiful and unique, varied landscape. Put yourself at rest and gain new strength enjoying the nature. Hiking is a good way to discover the extraordinary beauty of the Eifel region with keen eyes for detail. With its great number of places of interest, the area caters to various interests, so come, stay and enjoy yourself!